Mansel Reed slipped a welding helmet onto his head. In an instant, the Lowell High School 10th-grader was several stories in the air, fusing steel with an arc welder. It would have been heart-pounding stuff if Mansel actually was hundreds of feet up. Instead, he was wearing headgear for a virtual arc-welding trainer called the VRTEX 360, as part of a huge jobs showcase called MiCareerQuest 2015. 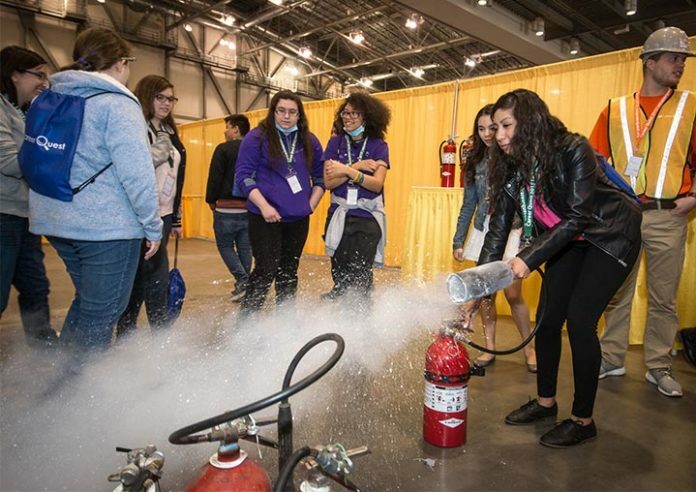 The sheer scale of the April 28 event at downtown’s DeVos Place — 6,000 students from more than 70 schools, plus 95 West Michigan companies — made it a first of its kind event, while showing middle and high school students a new way to look at potential careers. Four major industries were represented: advanced manufacturing, information technology, construction and health care. All those areas are vital to Michigan’s economy and workforce, said Jarrad Grandy, Kent ISD director of career readiness. Many companies have jobs in these fields going unfilled because of a lack of people with the right skills, he said. 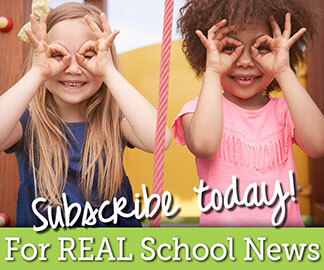 “We want students to know about the opportunities in these industries,” Grandy said. 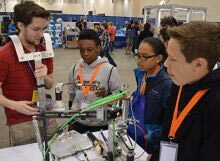 At MiCareerQuest, students spent 30 minutes wandering each sector, and could spend most of that time at any exhibit that caught their attention. 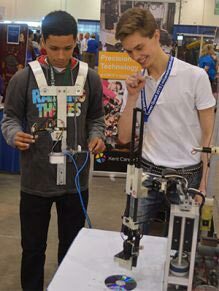 Students were able to get their hands on equipment like cranes, EKG machines and robots, rather than just walk by tables of brochures with career information. Here’s a glimpse of what students learned. The blending of hardware and software in Mansel Reed’s virtual headgear was intended to give students an idea of the welding skills and body positioning expected of welders, who may be required to scale great heights to accomplish their work. At this stage in his life, Mansel isn’t sure which career path he’ll take. But MiCareerQuest gave him some good ideas. Myles Ginter is set on becoming a civil engineer. The Kenowa Hills High School 11th-grader stayed busy shaking hands with people from the field. “Things like this give me a chance to talk to people who eventually might be my employer,” Myles said. Paige Clouse had some misconceptions dispelled about the medical field. The 10th-grader from Lowell High School said it’s unlikely she’ll consider an occupation in health sciences. But attending the interactive career fair helped her come face-to-face with her fears. “Bleeding dummies can make her scream,” chimed in classmate Abron Jazzmyne, who is mulling a career as a psychologist. Peter Rodriguez echoed her insights. The Wyoming High School 10th-grader didn’t realize it was possible to join his love of sports with physical therapy until he discovered there were athletic trainers. MiCareerQuest gave Dexter C. Lee III the idea he could design a better video game than the one presented by students from Ferris State University’s digital animation and game design program. Don’t tell that to the Ferris students who put their hearts and souls into creating the virtual reality game, which requires players to travel between a series of islands. Dexter, a seventh-grader at Grand Rapids Public Schools’ C.A. Frost Environmental Science Academy, said he would have added some more impressive moves. Benji Cervantes, also a seventh-grader at C.A. Frost, seemed to enjoy the techie gadgets at the fair. He helps his dad build computers and is considering a career as a graphic designer. Lindsey McKee, a sophomore at Forest Hills Eastern High School, is mulling a career as a paramedic or fire fighter. She and her friends were fascinated by the demonstration of a chemical used for fire suppression in areas where sensitive electronics are located. Exhibitors displayed a tank of about two or three gallons of the chemical called Novec 1230, worth about $5,000. They submerged iPads and smart phones in the tank for hours, and showed students how the devices still worked. “It’s cold,” one of the students said while holding a business card soaked with the chemical. Brock VandenBerge, another Forest Hills Eastern sophomore, said he’s still considering his career options. Sometimes it’s as valuable to know what you’re not interested in doing as it is having a single career choice, he said. Major sponsors of the inaugural MiCareerQuest were Spectrum Health, DeWys Manufacturing, The Right Place, Sable Homes, Associated Builders and Contractors Inc., Kent ISD, Grand Rapids Community College, Davenport University, Ferris State University and The Geek Group.